I am so excited to show you one of my Christmas Trees for this year! Part of my goal here is to show you how you can make simple changes to the tree you put up last year and make it look fresh and new for this year. 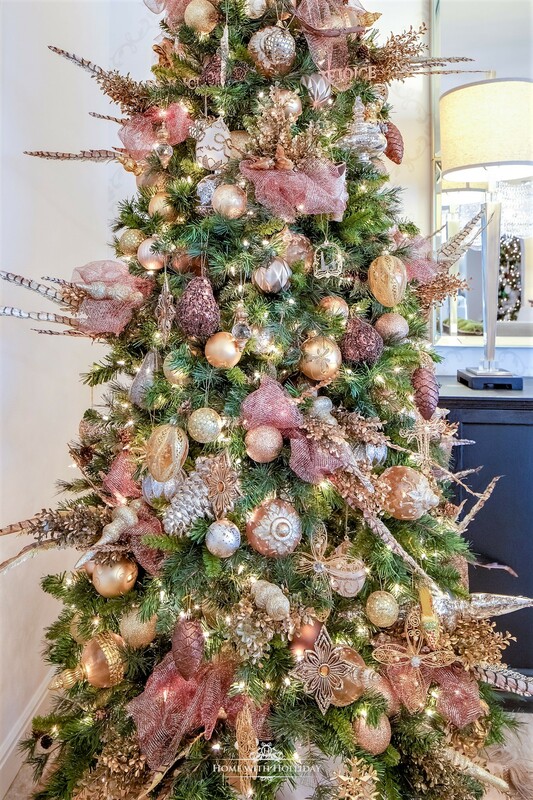 Today, I am sharing the Mixed Metallic Christmas Tree that I feature in our dining room. This is how I decorated the same tree last year (the next two photos). To see the whole post, click here. This year, I decided to keep the same color palette for this tree for a couple of reasons. One, using metallic tones gives off a very neutral design so that I can easily work with the colors for the table settings I set during the season. We entertain a lot! Secondly, these colors look really nice with the painting I have right next to the tree. Coordinating the colors with the decor in the rest of your room really gives a “pro” look to the tree. There are a couple of things I did to change the design for this year. Last year, I wrapped the copper mesh ribbon (it looks a little pinker in these photos than it really is in person) around the tree continuously. To mix it up, I used the same ribbon but cut it up into smaller pieces to disperse the fabric throughout the tree in a different way. As you can see, I also changed up the topper. I had the curly wood embellishment left over from my arrangement (below) from my Jewel-toned Thanksgiving Table Setting that I posted a few weeks ago. I love the organic look it adds to the tree! To help add texture and girth to my trees, I always add some combination of Christmas “picks” or “sprays” that coordinate with the look I am after. On last year’s tree, I used three different pieces to accomplish this. For this year, I eliminated the faux leaves (they had sadly seen their last day) and just went the two others I used. Additionally, I pushed them deeper into the tree to tighten up the look. These metallic pheasant feather sprays (from Hobby Lobby) tied everything together. My mixed metallic Christmas tree also coordinates with the decor I pulled together for my buffet. I wanted the design to be an extension of the tree. Notice the little touch of “Texas” on the tree! I always add touches of my native state to my trees! As a finishing touch, I always coordinate my gift wrapping with my trees. It is always so rewarding to finish a tree and be able to enjoy it for the rest of the season…my favorite season! This coming week, I will be sharing another one of my trees along with some other Christmas decorating inspirations. You could also stop by my recent post with Easy and Elegant Christmas Decorating Ideas. Do you do the same tree every year or do you change them up?! What a beautiful, stunning tree. This coming from a non lover of raspberry/pink color. The use of the feathers with what appears to be minature preserved boxwood is a genius combination. The color of the feathers (which don’t looks quite pheasant) is a perfect compliment to the whole tree. In my opinion it is the most stunning tree yet. What a wonderful job. The combinations of these three metals look incredible. Thank you so much, Haley. Using different metallics can provide such great texture. Have a great day!